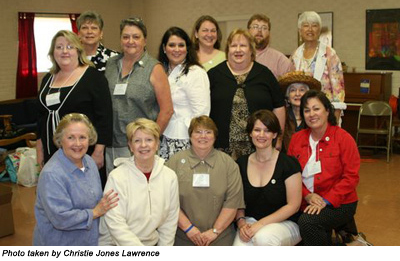 The officers and directors of Mississippi's First Alumnae Association for 2009-2010 were installed during meetings at Mississippi University for Women's Homecoming April 17-19. They include, front from left, president-elect Lillian Wade of Columbus, parliamentarian Lydia Quarles of Starkville, director Del Hamilton of New Orleans, La., immediate past president Kym Gore of Tampa, Fla., director Jane Dennis of Little Rock, Ark. ; middle, treasurer Deborah Hodges of Lucedale, director Jimmie Moomaw of Avondale Estates, Ga., president Angharaad Teague of Pensacola, Fla., secretary Barbara White of Jackson, chapters representative Josephine Tierce of Indianola; back, director Lenore Griffin of Ackerman, vice president Neely Hunter of Brunswick, Ga., director Mack Spencer of Calhoun City and past presidents' committee representative Bev Jones of Starkville. Not shown are directors Gus Argrett, Barbara Austin, Ricki Garrett and Kimberly Griffin, all of Jackson.